Drum roll, please. At the start of September, I set two lofty goals. I pledged to reduce our grocery budget by 20% to keep the total spending to $200 for the two of us. Since my focus was already set on the kitchen, I figured I would keep my sights set on it by creating a second goal of decluttering the kitchen. Now that September has almost come and gone, let’s take a look at how those goals shook out over the past month. With some careful planning and at least one trip to the grocery store every week, I was able to clock in at $192.44 for groceries and household items. While it would be easy to dismiss this as luck (the coupon stars did align for a frozen pizza stock up), it was really about intentional eating. Breakfast was never any challenge, because I have a morning routine that works for me…and only costs $7 a month. The real challenge was combating my tendency to change my mind when it comes to meal options. Rather than buying something and realizing I didn’t have a taste for it, this month, I made my list, checked it twice, and stuck to it. I also took inventory of my refrigerator, freezer, and cupboards, purposely weaving oft-overlooked items into weekly meal plans. And I’d be lying it I said that having a garden did not help a ton when it come to fresh, organically grown vegetables. Looking ahead, I am a bit nervous for next month, since I know our garden will be producing less. I’m still going strong with indoor gardening, but it just isn’t the same. Still, I figure if I can keep shopping seasonally, I should be OK. It’s also worth pointing out that $15 of that $192.44 went to 10 pounds of apples from a local orchard. We won’t be buying apples for at least another week. Sometime next week, I plan to post some tips and tricks that I learned to really stretch our grocery budget. I’m also kicking around the idea of posting a list of what we actually bought versus what we used that was already in our cupboards and from our garden. If that would be of interest to you, let me know. And speaking of using items that are already in our cupboards…let’s talk goal two. It was not a total fail, though. My refrigerator and freezer are tidy. I boxed up over 30 kitchen items (think mugs, Oxo storage containers, the dreaded hardboiled egg slicer) to sell and donate. I also donated a box of pantry items to an impromptu food drive that my school hosted two weeks ago. It turns out that we had more than enough pasta sauce, canned vegetables, and cereal to go around. Plus, I had a small stockpile going already, since I purchase one item for the food pantry every week. In terms of results, it does not appear that anything is different in my kitchen at first glance. My flat surfaces have always been free of clutter (clap for me, Marie Kondo). But by consolidating my storage containers, I actually freed up an entire cabinet and a whole drawer. That’s right. They’re empty. And I have no desire to fill them back up. 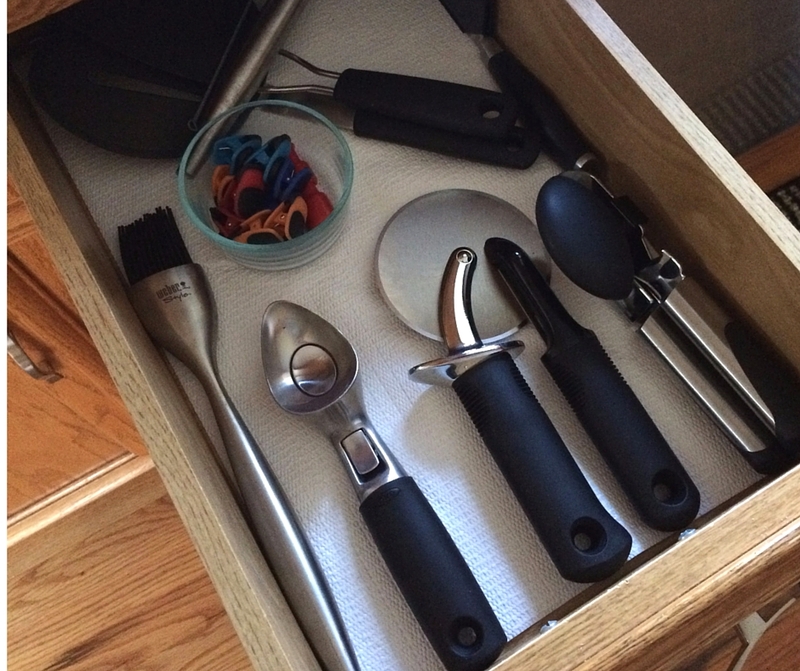 Most impressively, though, is our utensil drawer. I knew I had done well when Mr. P opened the drawer to retrieve the can opener let out a gasp. Every item in that drawer is now visible and useful. Everything else? Boxed up in the basement awaiting a trip to the resale shop. So why do I say I failed this goal? Our kitchen has a built-in desk, which functions as a command center. I started tackling the desk drawers, financial documents, junk mail, and office supplies, but I would be lying if I didn’t say that was still a work in progress. I’m hoping to have that totally under control by the end of October. At that time, I’ll do a write up with actual numbers and percentages of items removed from the entire kitchen/office combo. So Tell Me…Did you set any goals for September? How’d you do? Are you doing any goal setting for October? Care to share? 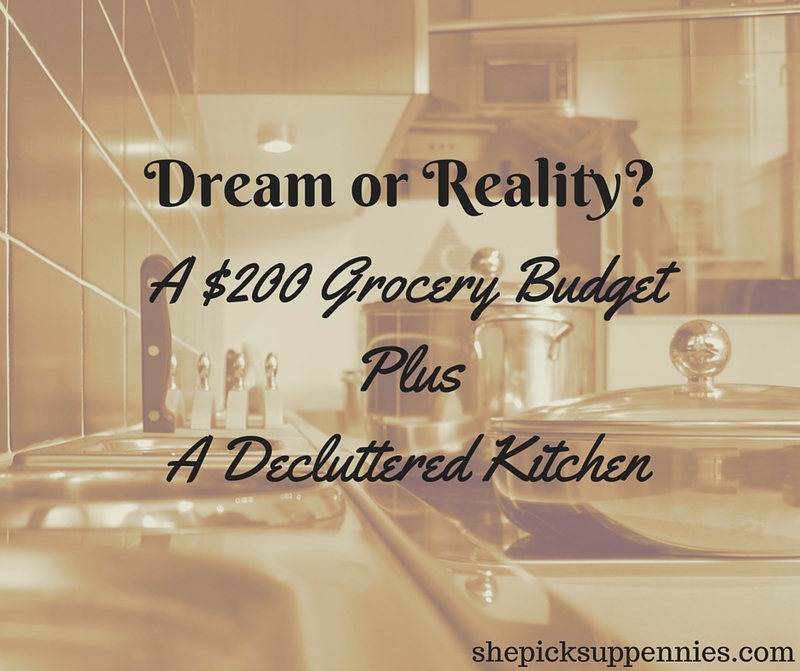 I need to declutter my kitchen again! I always have too many coffee mugs and large insulated cups. I put them away but they keep finding their way out somehow. Maybe it’s time to donate! Isn’t it amazing how stuff creeps back out? It was definitely time for us to donate. I think that decluttering my kitchen has to be my favorite thing ever. It’s the one room where I notice an immediate improvement just because I can function so much better hah. I know you think you failed, but sounds like you did great in my book! Just starting is something to be proud of 🙂 Plus that drawer looks awesomely clutter-free now! It is pretty, isn’t it? 🙂 I still get excited when I open the empty cabinet or the empty drawer. When we moved in, I thought I’d be so upset having a house without a pantry. 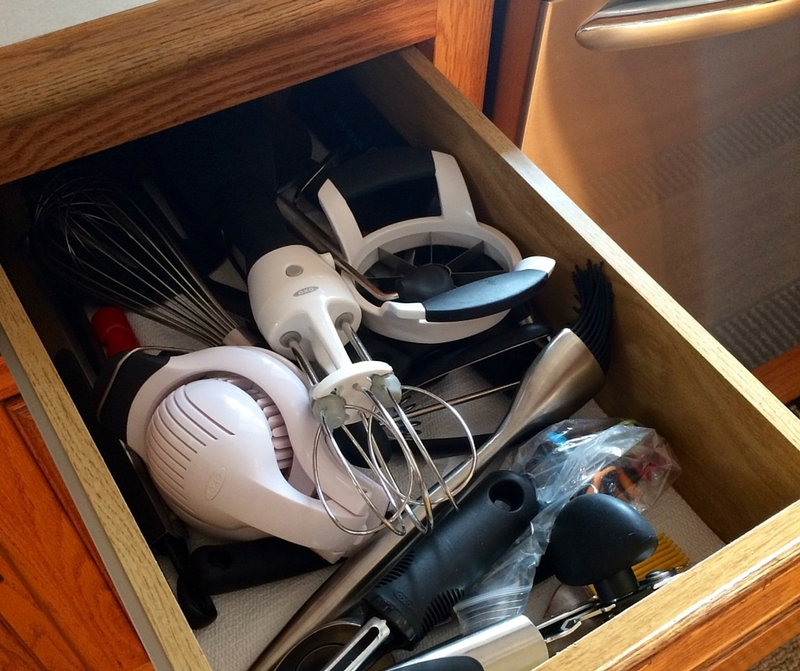 Turns out, we don’t even use all our cabinets if I’m more purposeful with what I allow in my house. I definitely need to tackle the kitchen. I’ve been focusing on closets, bedrooms and our home office, but the kitchen is full of junk and storage containers without lids (plus lids without storage containers). I think we’re overdue for a food inventory too. Great job on the food budget and it sounds like a great job on the decluttering as well, even if it’s still in progress. Thanks, Gary! Isn’t it amazing how storage containers do that? I swear they multiply when you close the cabinet. I’ve done a big de-clutter of the bedroom and kitchen in the last year, but I am guilty of somehow acquiring enough crap to make it feel cluttered again! For every item you bring in, one has to go out! Yes! Right there with you. The biggest area of clutter is my closet(s). So I try to do 3+ out for every one item that comes in. Really, I haven’t shopped to do anything other than replace in so long, it feels like I might be turning a corner.